Lake Thunderbird was constructed in the late 60’s by damming the Little River, a tributary of the Canadian River. Although its initial purpose was to serve as a municipal water source to the surrounding communities, Lake Thunderbird is an ideal sporting venue and one of the more popular metro area lakes for outdoor recreation. In addition to hiking, biking, boating, fishing, and camping, the lake features two swimming beaches, an archery range, and deer or waterfowl hunting when in season. Lake Thunderbird has a surface area of 6,070 acres with 86 miles of shoreline. The average depth is 15.4 feet, and the maximum depth is 57.6 feet. From Oklahoma City, follow I-35 south to Norman, Oklahoma. Lake Thunderbird is located 13 miles east of Norman, OK. The main entry points are off of Alameda Drive on the north side and Highway 9 on the south side. There is no exit for Alameda on I-35, but take either Robinson eastbound to 12 Ave. NE and follow south to Alameda. Highway 9 is a bit further south and has entrances to several Thunderbird parks. Metro fishermen know eastern Oklahoma is thought of as the best for fishing, lakes such as Eufala or Grand. In the central part of the state, it's hard to get much better than Thunderbird, though. Anglers often have good luck with channel catfish, saugeye, crappie and largemouth bass. If you want to take it to another level at Thunderbird, check out the Big Catch Fishing Tournament. Held each May in conjunction with the Muscular Distrophy Association, the event fills the lake with people, both the determined competitors and fun-seeking families alike. There's a $5,000 cash prize, and a valid Oklahoma fishing license is required. Lake Thunderbird boasts 9 boat ramps. The Calypso Cove Marina, located on the south side of the lake, is a full-service marina with wet and dry storage; paddle boats, canoes, and pontoons for rent; and a store with live bait, beer, and food. This marina also offers a place to fuel up your boat. Little River Marina on the north side also has a store and is a bit bigger but does not offer fuel nor rentals. If you want simply to hang out and go swimming or play in the many park campgrounds, you are in luck. The only campground with an entry fee is Little Axe on the east side of the lake. The charge is $5 per car. If you would like to claim a spot for your own, Lake Thunderbird has over 200 RV areas, 30 of those with full hookup, and are anywhere from $20-$28 per day. There are numerous “primitive” camping areas for tent camping at $12-$17 per day. Once you have claimed your campsite, a park representative will come by to collect the fee. Except for those at Little Axe, all campsites are on a first come first serve basis. To reserve a campsite for tent or RV camping at Little Axe, do so online at gocampok.com. The Clear Bay area also has a full-service restaurant called the Clear Bay Cafe. With outdoor seating on the waterfront, it serves steak, seafood, burgers and more. Note: Clear Bay Cafe was damaged by flooding in the spring of 2015. Though park officials say the intent is to open the restaurant once again, it is currently closed indefinitely. Little Axe has family shelters for $25 per day and the lake also has 10 large picnic shelters for $75 per day. To reserve, call (405) 360-3572. 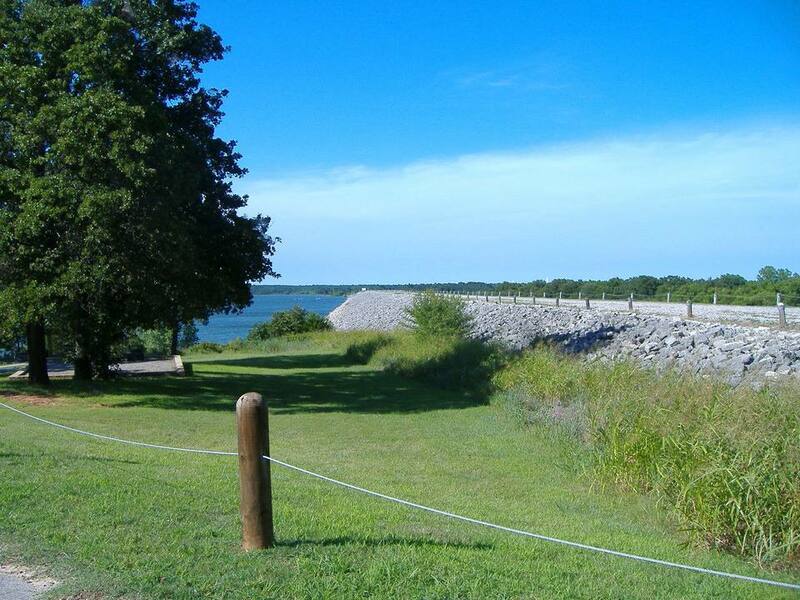 Lake Thunderbird has over 18 miles of trails. Detailed maps are available online at www.travelok.com. These trails are marked for either novice, intermediate or expert hikers/bikers. Lake Thunderbird also boasts 4 miles of equestrian trails, making it a prime Oklahoma City area destination for horse riding. These trails have 12 obstacles along a scenic trot around the lake. Off of Highway 9 on the south side of the lake, enter the Clear Bay Area to access these trails. There is no entry fee for trail use, but they accept donations. You must bring all your own equipment, and there are no stables or horse rentals available. Offering archery lovers a safe place out in nature to practice their skills, the Lake Thunderbird Archery Range is located on the north side of the lake off of Alameda Drive. There is no fee required; however, you must bring your own target and equipment. Also located in the Clear Bay Area on the south side of the lake, you will find the Lake Thunderbird Discovery Cove Nature Center. This is a wonderful place to bring children to learn about the animals that live in Oklahoma. Families and schools bring kids year-round to experience the touch and feel center. Live snakes, fish, turtles, tarantulas, scorpions, and much more can be observed and touched. Safety classes are given to kids to help them learn about what to do if they encounter or are bitten by poisonous snakes. The nature center also provides fishing clinics, animal tracking classes and guided tours of the nature trails. Note as well that Norman is located in a bald eagle migration area. Between the months of December and February, many eagles can be found roosting in the surrounding trees. Explore the trails on your own and try to find these majestic creatures. On designated Saturdays during these key months, you may sign up for the Eagle Watch tour through the Nature Center. To do so, call (405) 321-4633. Space is limited, so reserve your spot early.